2019 Summer CSA Details Coming in January! 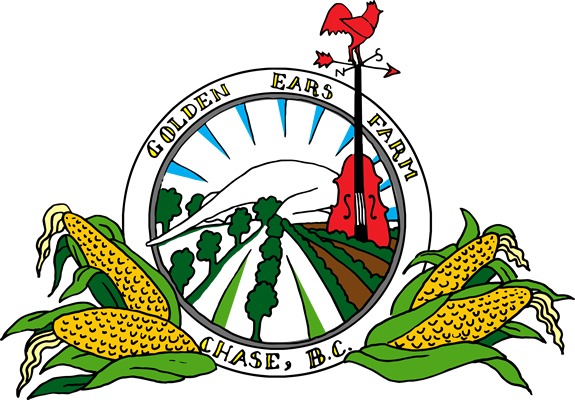 Join us at Golden Ears Farm, Chase, BC, to see what happens on an organic farm over the course of a full season cycle. We grow a wide variety of vegetables and fruits. We attend farmers' markets in Chase and Kamloops, run a CSA Food Box, and sometimes host events such as seminars and concerts. We are deeply involved with the farm/food community, so there are lots of opportunities to attend farm tours & potlucks and get involved at an organizational level with local food groups. Working with us mainly involves propagation, (trans)planting, weeding, harvesting, selling organic vegetables and fruit, as well as learning-through-doing while working alongside the farm manager, casual employees and berry pickers. Care of our laying hens is also part of the day-to-day goings-on here. Once confident, the employee is expected to be able to complete jobs without constant supervision. Time will be made regularly for focused learning on topics such as: crop planning, soil basics, weed ID, greenhouse management, and planting schedules. There will also be plenty of opportunities to help out with the parts of our farm you're most interested in -- food preservation, slaughter and butchering, selling at local farmers’ markets, learning about composting, helping with our growing CSA program, construction and carpentry. There will be some shared meals, however most meals will be the employee's own responsibility -- with free access to the 'farmer' corner in our cooler to choose fresh fruit & veg for your meals. Private on-farm accommodation is available with shared laundry and shower. We have a beautiful multi-purpose studio, sauna, fire-pit, and extensive library, which the employee is welcome to use. We ask that the employee commit to 35 to 40 hours per week with 1.5 - 2 days off a week from mid-March to mid-or late October. Part-time hours are the norm for the beginning and end of the season. A visit beforehand definitely seems like a good idea for all of us, if it's possible! A wage of $15/hour will be paid, with the possibility of earning additional income through fruit picking. * is hard-working, physically fit (able to engage in tasks that involve bending, squatting and lifting up to 50lbs, sometime for hours at a time), enthusiastic about sustainable organic farming, self-sufficiency, and highly motivated to help out! * our skill set wish list includes the following (although willingness to learn these things is just fine, as well): experience operating tractors and power tools/chain saws; equipment maintenance; tree pruning/care; irrigation; construction and fencing. Applications should be submitted by March 1st, 2019 for consideration and interviews will take place on a rolling basis until a suitable candidate is hired. North Okanagan Organic Association: NOOA 04-208.